Welcome to the most current Housing Trends News. It contains national and local housing information that you may find useful whether you’re in the market for a home, thinking about selling your home, or just interested in homeowner issues in general. The Housing Trends News contains the latest information from the National Association of REALTORS®, the U.S. Census Bureau, Realtor.org reports and other sources. Sound decisions can only be made with accurate and reliable information, and I am happy to be a trusted resource for you. Thank you for the opportunity to provide you with this monthly News, and I look forward to answering any questions you may have and to the opportunity to be your REALTOR® in the future. Forbes recently spotlighted the top places to invest in the new year, whether for investors looking for rental properties or young professionals looking to make their first home purchase. The cities in its top 20 list all have strong job markets and population growth, relatively low home prices, and many are still considered undervalued. The Clear Lake area is conveniently located within a 25 minute drive of downtown Houston. As oil prices have dropped, so goes mortgage rates. The 30-year fixed-rate mortgage averaged 3.66 percent this past week, the lowest weekly average since May 23, 2013, Freddie Mac reports in its weekly mortgage market survey. What’s more, the 15-year fixed-rate mortgage dropped below 3 percent, also for the first time since May 2013. According to the world’s leading platform for home remodeling and design, Houzz.com, nearly half of us remodel to prevent potential health problems. Think touchless flushing toilets, healthier paints and carpets, better air filtration systems. The heated tile floors and warming towel racks show no signs of going away anytime soon. Walk in showers with over-sized shower heads are popular votes too. Large soaking tubs are high on the wish list too. Taking something destined for the landfill is now getting a new life. If it can be sanded, painted and re-used like old wood, its getting a second look. Call it the love it or list it phenomenon but statistics are showing that while housing markets have been hot, the price inflation in some areas may be spurring people to renovate and remodel instead of deciding to move. Metals are making their appearance from counters, lighting fixtures, to sinks and to wall finishes. Coppers particularly are one of the up and coming. Retailers are always in front of the emerging paint color trends. Its almost like a subliminal message. Look at your favorite home goods retailer to find out which colors are popular. Subdued blues and greens are emerging as favorites this year. Gray is quickly emerging as the go to color instead of neutral beige. Dark charcoal cabinets mixed with white and black are popping up in kitchens and baths. The trend toward clean, simpler minimalist looks are growing in popularity. The desire to come home to a simple, less cluttered home is growing. Kitchen cabinets are turning back toward flat fronts. The use of higher end vinyl floor tiles is also coming back. It costs less than ceramic and is warmer on the feet. 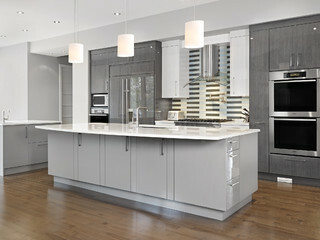 The turn away from stainless steel appliances and replacing cabinets vs painting them is also becoming popular. Single basin sinks are replacing double basin sinks. Average home remodel projects have increased from an average of $15000 to $20-25,000. Still hot on wish lists is the outdoor living space. The more year round this space can be used, the better.